The Views are spectacular from High Ledges! Field Trips .....If you have an idea - please send it to us! We are thinking of planning a major bus trip in alternating years with the Garden Tour, if we continue to run a tour. Let us know your preference by emailing: greenfieldgardenclub@yahoo.com. We loved our tour of Maple Grove on June 29, 2013. 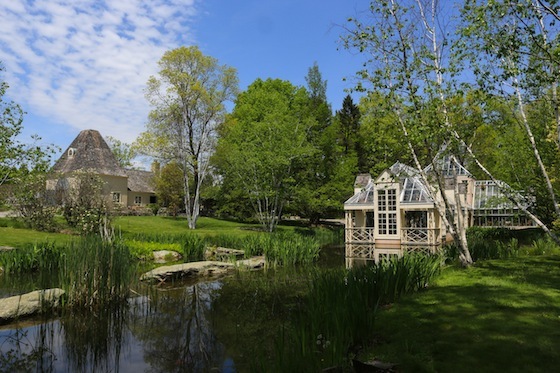 (John W. Trexler's one acre wonder in Boylston, MA.) John is the retired Executive Director of the Worcester County Horticultural Society and Tower Hill Botanic Gardens. His garden has been described as the "consummate collector's garden," reflecting his broad range of interests in the world of horticulture. We chose option number two - what shall we choose next time?! Look for the photos on Facebook! 2. Systematic tour of my collection of 400+ woody and herbaceous plants. Stonecrop, originally the home of Anne and Frank Cabot, became a public garden in 1992. The club has an open invitation from Barbara Licis to visit the gardens at Stonecrop, a 12-acre treasure in the Hudson Highlands at a wind-swept elevation of 1,100 feet. Stonecrop was the home and gardens of Frank Cabot, the founder of the Garden Conservancy. The display gardens include a diverse collection of gardens and plants including woodland and water gardens, raised alpine stone beds, a grass garden, cliff rock garden, as well as an enclosed English-style flower garden. Additional features include a conservatory, a display alpine house, a pit house with an extensive collection of choice dwarf bulbs, and systematic order beds representing over 50 plant families and their botanical relationships. The club can choose a $5 per person option for a self-guided tour with a map, or we can choose the $10 per person option for a tour led by a trained horticulturalist. The latter option requires a minimum of 10 people, a one month in advance confirmation, and a non-refundable deposit of $100. Picnicking is welcomed on site.